JUNEAU, Alaska — July employment was down by an estimated 0.3 percent, or 900 jobs, compared to July 2017. Retail had the biggest loss at 900 jobs. Oil and gas declined by 500 jobs over the year, and professional and business services lost 300 jobs. Construction employment grew by 300 through increased activity in Anchorage and the Interior. The other industries that grew were health care (900 jobs); transportation, warehousing and utilities (200); leisure and hospitality (200); and manufacturing (100). The public sector fell by 300 jobs. Federal government added 200 jobs while state government lost 300 and local government fell by 200. 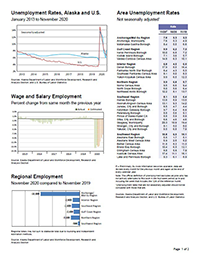 Alaska’s seasonally adjusted unemployment rate dropped for the third time this year. July’s rate of 6.9 percent was down from 7.1 percent in June and down four-tenths of a percentage point from the beginning of the year. The comparable national unemployment rate was 3.9 percent, down one-tenth of a percentage point from June. Not-seasonally adjusted rates fell in every borough and census area, following an expected seasonal growth pattern when the trifecta of tourism, construction, and fishing all approach their annual peak activity. The lowest rates were in the fishing-centered Aleutians East and Bristol Bay boroughs, each at 1.7 percent. Summer tourism pulled rates in Skagway and the Denali Borough down to 3.0 percent. The highest unemployment rates were in rural areas with less commercial fishing activity or tourism. Kusilvak Census Area had the state’s highest rate at 22.2 percent, and the Yukon-Koyukuk Census Area, Northwest Arctic Borough, Bethel Census Area, and Nome Census Area all topped 10 percent.